One of the first pieces I published under Lynwood Music was Andrew's String Quartet No.1. In those days our photocopier paper was on a roll and our ink in a bottle! I created Andrew's first brochure with this equipment too. There were not too many compositions published by Lynwood Music at that time (the work was premiered in 1980), so they fitted on to 2 sides of an A4 sheet folded lengthwise. I designed the title page on an old fashioned typewriter, writing Andrew's name in rows of crosses, like a tapestry. As time went on, Andrew's list of works grew to fill an A3 sheet folded in concertina fashion. Eventually the works filled a 30 page printed booklet, before we went on to the early days of the website. The first performance of String Quartet No.1 was in Blakedown Church, Worcestershire (We lived in Blakedown then). At first some people didn't take this work seriously. String quartet players in those days were indeed very serious. There were a number of famous Quartets, whose concerts were extremely popular, but also highbrow. Andrew entered this world with a light hearted, jazzy, dance-like piece. Moreover he wrote the parts out in blue biro (no computers then) and his double stopping was difficult and hard to read. Even the Perry student quartet, who premiered the work, treated it as a less important part of their programme of otherwise established works. In those days only composers from past eras were respected. The audience in Blakedown Church, however, seemed to like the jollity and jazz of Andrew's music. When the Arioso quartet gave their first performance of String Quartet No.1 as part of their 1983 concert series at the Birmingham and Midland Institute, it went down very well with the concert goers. As time went on I was able to typeset the work and redistribute the double stopping, to make it more 'string player friendly'. Performances, both by string quartets and string orchestras, have continued to take place, with audiences nowadays really enjoying the music's groovy and humorous nature. Our daughters and I have performed in the work on several occasions. Anna organised a Central England Ensemble trip to Paris in 2007 and a performance of the first movement of String Quartet No.1 in La Madeleine. I will never forget the thrill of playing in that performance! Anna also included movement 2, which she entitled 'Andante with Jazz', in her school string orchestra concerts in Berlin not long ago. Paula has put my latest pdf copies of Andrew's 3 quartets on the website, to be sold as digital downloads, as well as performances which I originally recorded on cassette and have converted to CD. Anna was a toddler at the time of the composition of String Quartet No.1 and Paula a twinkle in her Dad's eye! Because of the initial reaction to his first string quartet, Andrew chose a serious and passionate atmosphere for his String Quartet No.2. The outstanding Isis Quartet (Michael Seal, Leon Gee, Garry Doidge and Fa Fa Jin) performed this in many venues, following a National Competition which won them a number of recitals. I particularly remember the Isis Quartet's concerts in the Countess of Huntingdon Hall in Worcester and in the Place Theatre, London, in 1990. Before the London concert, Andrew and I had a lovely time discovering quaint streets and cafes in Bloomsbury, just a stone's throw from the busy Euston Road. The performance took place just before a short opera composed by 3 of Andrew's students. 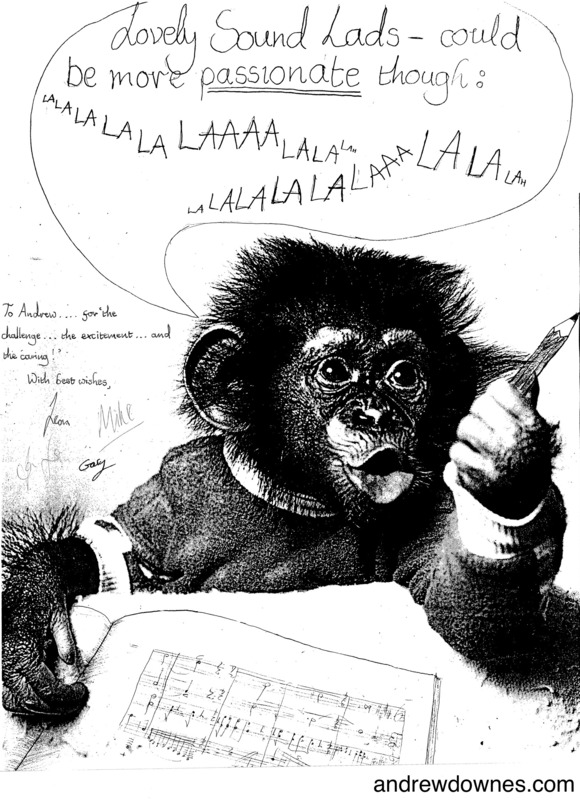 What I remember most about String Quartet No.2 and the performers, however, was the wonderful framed drawing, which the Isis Quartet presented to Andrew, of a chimpanzee sitting in front of a musical score and saying: "Lovely sound, lads. Could be more passionate, though!" The players had all signed it and put "To Andrew ... for the challenge ... the excitement ... the caring!" Andrew's relationship with his students was, and still is, a very close and caring one. 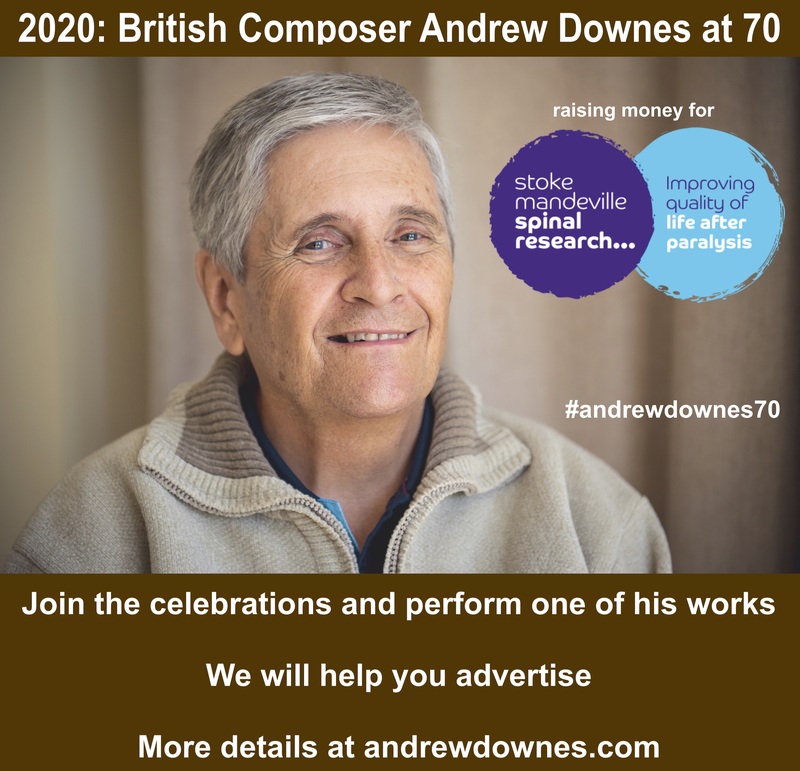 Andrew dedicated his String Quartet No.3 to Indian composer, John Mayer, whom Andrew had appointed Composer in Residence in the new School of Composition and Creative Studies, which Andrew set up at Birmingham Conservatoire. John Mayer was a fount of knowledge on Indian ragas and also encouraged Andrew to make 2 concert tours with him to India. The String Quartet No.3 has strong Indian influences. It mimicks the sitar, the tanpura, the tabla and uses ragas. The Almira Quartet (who had also given 2 performances of String Quartet No.2) commissioned and gave a superb first performance of the work in the Birmingham and Midland Institute in 1995. They went on to perform it in numerous venues around the UK thereafter. When our daughter, Paula, was a student at Cambridge, she formed, with 3 fellow students, the Thomas Quartet. They performed Andrew's String Quartet No.3 in St John's and Trinity colleges. Paula had the task of mimicking the tabla on her violin. The stunning performance by the Thomas Quartet in the wonderful acoustics of the Chapel of Trinity College is on the website (extract from the raga section).